RAWALPINDI (92 News) – Chief of Army Staff (COAS) General Qamar Javed Bajwa witnessed successful training launch of short range surface-to-surface ballistic missile ‘NASR’. According to the ISPR, Pakistan has successfully undertaken a series of training launches and tests trials during the current week for validation of new technical parameters of ‘NASR’ with enhanced range from 60km to 70 km and flight maneuverability. This weapon system will augment credible deterrence against prevailing threat spectrum more effectively, including anti-missile defenses. NASR is a high-precision weapon system with the ability of quick deployments. 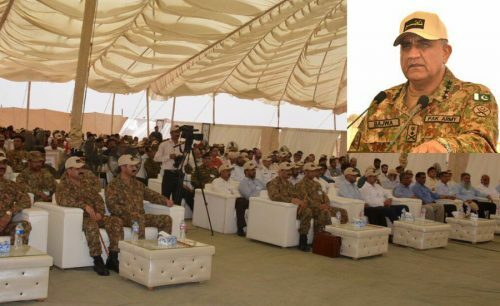 The COAS appreciated the standard of training and operational preparedness of Army Strategic Force and congratulated the scientists and engineers on achieving this significant milestone towards Pakistan’s credible deterrence capability. He expressed his complete confidence in effective command, control, safety and security of all strategic assets and measures being taken to augment these. “You are our real heroes, the unseen, we owe you our gratitude,” the COAS remarked. “NASR has put cold water on cold start,” said the COAS. “War must be avoided at all costs. Our strategic capability is a guarantee of peace against a highly militarized and increasingly belligerent neighbour. Pakistan will go to any length to ensure regional peace and stability. We wholeheartedly support all government efforts at peace through dialogues. Our capability is only meant to ensure, no one thinks war remains an option.” Director General Strategic Plans Division Lieutenant General Mazhar Jamil, Commander Army Strategic Force Command, Lieutenant General Mian Muhammad Hilal Hussain, Chairman NESCOM, Dr Nabeel Hayat Malik, scientists and engineers of strategic organizations also witnessed the launch. Chairman JCSC General Zubair Mahmood Hayat, Chief of Air Staff Sohail Aman and Chief of Naval Staff Admiral Zakaullah have congratulated the start forces on the achievement. Meanwhile, President Mamnoon Hussain and Prime Minister Nawaz Sharif, while conveying their appreciation, have lauded the efforts of all those involved in the missile tests and trials.